Rare Dimes with Bullish Futures. The rare dimes showing up in our "Bullish US Coins" section are the cream of the crop of US dimes. Due mostly to strong collector demand, price advancements over a period of many years in the past have been the norm, and we can logically expect to see continued value appreciation in the future. There are many other rare US dimes that could have been highlighted in the "Bullish Coins" section. You may ask... why aren't more listed? Well, when a coin gets listed here, it gets a little "special treatment". For each date , in addition to detailed commentary, there is a feature called "The Year This Coin was Minted..."
The purpose of this feature is to connect coins with history, in keeping with a sub theme throughout this website. It's interesting to know what stories were headline news when the highlighted coin was new and shiny. As soon as we find more time, more "Bullish" dimes will be added to the 1916-D. Stuff like the 1871-CC Seated Liberty Dime and the 1895-O Dime will someday receive the same type of review. (Hmmm... 1871... wasn't that the year of the great Chicago Fire?). If you've arrived on this page hoping for advice on dimes having extraordinary potential for future value increases, and are a little disappointed to see only one date, you are still in luck. There are a couple of other places on this site you can go to get information on coins holding this type of promise. (though you won't get as much of a history lesson). The Rare Coin Values Index tracks 87 US coins that have good records of popularity with collectors, with every expectation of continued demand into the future. The goal of the Index is to measure the overall strength of the US rare coin market. You may also get "best bets" by studying the key date analysis for every entry in our US Coin Types section. The 1916-D is the key coin of the Mercury dime set. Although it is a classic rare US coin in every respect, the 1916-D hasn't been doing so well over the last few years. No one should worry about losing money on a purchase. This little coin will always be respected by collectors. Instead, potential buyers should view today's prices as a bargain opportunity that doesn't come around very often. In the last 25 years, Full Split Bands (FSB) has become a very important modifier to Mercury dime values. True FSB Mercs nearly always command a hefty premium over non-FSB examples of similar MS grade. Never buy a 1916-D from a questionable source. As is the case with many US coins in high demand, dishonest individuals have cheated the system by altering other Mercs to resemble this rare dime. The world was horrified in 1916 by the ongoing carnage of the Great War (later renamed WWI), as the European nations fought to a stalemate. The following year, American "doughboys" arrived en masse "Over There", turning the tide of war in favor of the Allied Powers. Mexican revolutionary Pancho Villa and his gang murdered 18 Americans in northern Mexico, then crossed the border and ransacked Columbus, NM, killing 17 more US citizens. In March, 1916, US President Woodrow Wilson retaliated by sending General John J. Pershing and 5000 troops into Mexico to capture Villa "dead or alive". Pershing returned home in early 1917, with Villa still at large. President Wilson narrowly won re-election in 1916, defeating Charles Evans Hughes, by a count of 277-254 in the Electoral College. Also in 1916, a new style of music called Jazz swept across the US, the National Park Service was established, and Boston (AL) defeated Brooklyn (NL) in the baseball World Series. 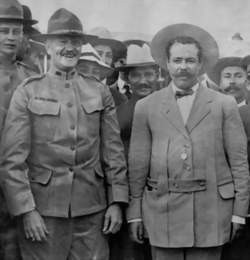 General John J. Pershing and Pancho Villa, photographed together in 1914. Two years later, Pershing led US soldiers into Mexico to hunt down Villa, but returned home empty-handed.